Screenshot of part of Tom Brady’s first tweet. FOXBOROUGH, MASSACHUSETTS – When New England Patriots QB Tom Brady woke up this morning, he must have had some April Fool’s Day mischief on his mind. 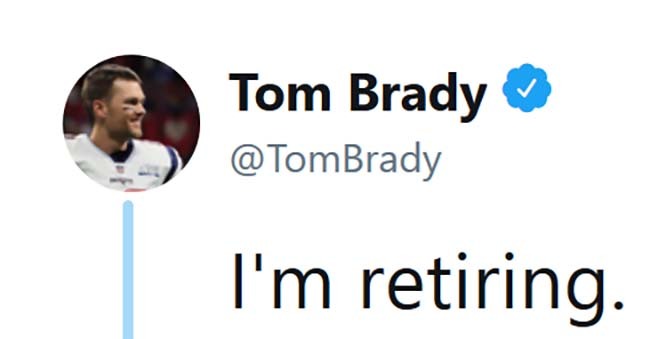 The man who Patriots fans would say is the greatest football player of all time had a new Twitter account, just opened in the last month or so, and had never sent a Tweet. Brady’s official Twitter account now has 164,000 followers and climbing. Brady’s April Fool’s Day tweet had received over 36,000 retweets and almost 118,000 “Likes” as of the time of the writing of this piece. Not bad for an April Fool’s Day launch!